Laura Carey, promising Irish artist! We came across the work of Laura Carey on Australia’s established art & design magazine Frankie’s website. 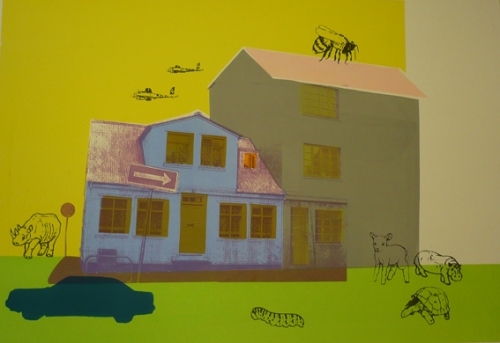 We we’re then linked onto a her blogsite and shop where we found some great work inspired by suburbia. Laura Carey’s work has been heavily based around her personal relationship to suburban life, having been intrigued by the mass of suburban landscape that surrounded her in Dublin. Her work looked at our evaluation of the landscape in which we live, the known sphere around us in which we discover our place in the world and our own relationship to it. Laura is currently based in Sydney, a thriving culture of art and design, where she is finding new inspiration for her current work. Great work Laura, we look forward to seeing more!